It would appear as a construction of complex carbonated molecules. You would see leaves catch atmospheric carbon, in gaseous form (CO2), and transform it to a solid state in the tree. This tree has a high photosynthetic rate: it fixes more carbon than it releases. The tree does not lack water or sunlight, and the temperature is nice enough. But come back at night-time, during winter or a heat wave... Deprived of winning climatic conditions, the tree diminishes or stops photosynthesis. The tree releases more CO2 than it fixes. It is, at that moment, a net producer of atmospheric carbon. In order to grasp the importance of forest in the global carbon cycle, we must thus understand the effects of environment on gas exchange, water transport and on the general growth of trees. 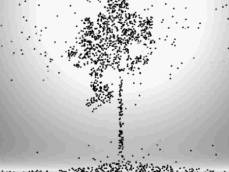 The images in this simulation were extracted from the "Carbon Tree" website. This website is updated based on carbon flux data collected in real time on a Scots pine, in Finland.